North Chicago, Ill.-based pharmaceutical company AbbVie, Inc. is feeling the heat as drug pricing reform and competitive pressures threaten to undercut the sales of its blockbuster drug Humira. Sales of Humira, an immunosuppressant used to treat autoimmune disorders such as psoriasis and Crohn’s disease, accounted for nearly 63 percent of the company’s $25.56 billion revenue for fiscal year 2016. Shares of AbbVie have risen 13 percent over the past year to close at $61.84 on Tuesday, compared with a 25 percent gain for the Standard & Poor’s 500 index. AbbVie’s stock price is expected to rise to $70.56 in the next year, according to 18 analysts surveyed by Bloomberg. 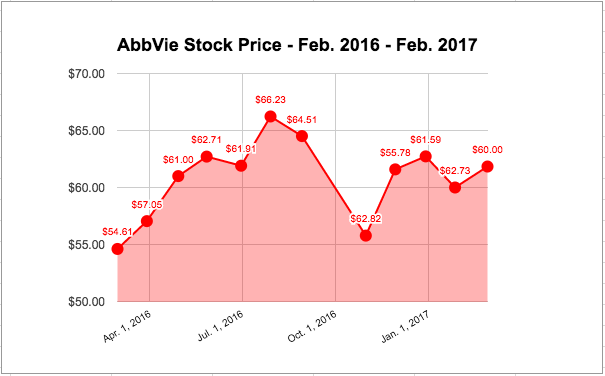 Compared with its competitors, though, Abbvie’s shares are relatively cheap. The company’s 12-month trailing price-to-earnings ratio stands at 13.93, compared with a median ratio of 19.95 for all large pharmaceutical stocks in North America, according to Bloomberg Intelligence. Humira could be a ripe target for the next wave of pricing reform outrage. After a January price hike, a 40 mg Humira autoinjector pen costs $5,330 wholesale on average. That adds up to nearly $64,000 in yearly expenses if a patient uses one Humira pen a month. Kelli Carlson, a 28-year-old from Woodbury, Minn., used to take Humira to treat her psoriatic arthritis. The drug cleared up her skin and lessened the swelling in her joints, but she quit taking it because using the autoinjector was too painful. A monthly supply of Humira cost her $1,000 to $2,000 after insurance, depending on how many doses her physician prescribed, Carlson said. Drugs like Humira are worth the price tag because of the potential to reduce long-term healthcare costs, said AbbVie CEO Richard Gonzalez in a January conference call with investors following fourth quarter earnings results. Concerns over pricing reform waned after November’s presidential election, but the pharmaceutical industry continues to brace itself as President Donald Trump’s position on the issue remains unclear. Trump met with Eli Lilly and Co. CEO David Ricks and other Big Pharma leaders in January to discuss his legislative agenda. Some potential legislative changes–namely, lowering the corporate tax rate and easing Food and Drug Administration regulations–could benefit the industry while other reforms, such as allowing Medicare Part D to negotiate drug prices, may hurt pharma giants. January’s meeting came after Trump unexpectedly criticized the pharmaceutical industry in a press conference preceding his inauguration. Pharmaceutical companies were “getting away with murder,” Trump said. This caused the NASDAQ Biotechnology Index to fall nearly 3 percent by the close of trading. AbbVie took the greatest hit, tumbling 3.61 percent at the close of stock trading after Trump’s press conference comments. 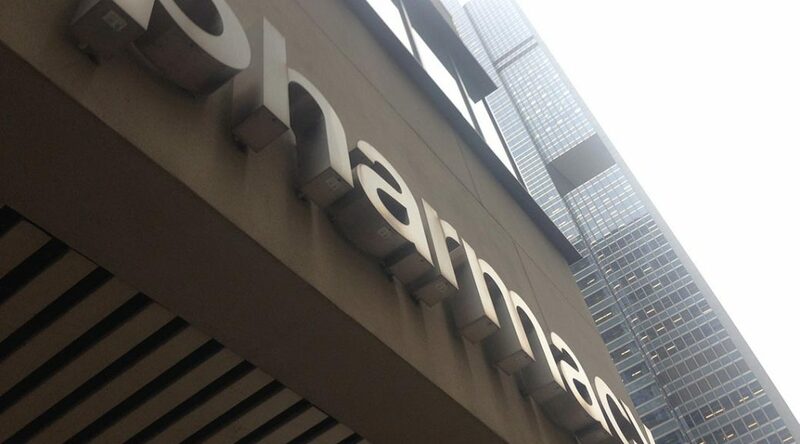 The company’s reliance on Humira may account for the large hit it took when faced with pricing pressures, said Dustin French, a health economics professor at Northwestern University’s Feinberg School of Medicine. AbbVie is strengthening its pipeline before Humira biosimilars hit the market, Gonzalez said in a conference call with investors. The company acquired cancer research company Stemcentrx Inc. in June, bolstering its oncology pipeline. AbbVie has also invested in the development of new immunology, virology and women’s health drugs. However, it’s unclear if these new drugs will make a big impact on AbbVie’s bottom line. “Given the importance of Humira to the [AbbVie] story, we do not see any pipeline catalysts in the coming months that are meaningful enough to overcome the Humira overhang,” said Vamil Divan, an analyst for Credit Suisse Group, in a research note. Competition from other pharmaceutical companies developing biosimilars–drugs that are proven to be similar to other FDA-approved products–is also putting pressure on AbbVie to ease its reliance on Humira. As a part of the Affordable Care Act, Congress passed the Biologics Price Competition and Innovation Act, which creates an abbreviated FDA-approval process for biosimilars. This truncated process allows companies to develop new products without incurring the high cost of human trials, French said. Humira’s patents should protect the drug from being overtaken by biosimilars in the United States until 2022, Gonzalez said. Some analysts question this guidance. Following AbbVie’s fourth quarter earnings release Jan. 27, investment firms Morningstar Inc. and William Blair & Co. LLC released research notes forecasting a Humira biosimilar entry into the U.S. market in 2020. “Litigation among multiple parties challenging Humira’s intellectual property is ongoing and will continue to create headline risk for the company in the coming years,” said William Blair analyst Y. Katherine Xu in a research note. In August, AbbVie sued to keep rival pharmaceutical company Amgen Inc. from selling a copycat version of Humira. The lawsuit alleges that Amgen’s proposed drug would violate 10 of the patents protecting Humira. Regulation that makes it easier for biosimilars to enter the market discourages pharmaceutical companies from developing innovative, but costly, drugs, some economists say. “As businesses get more and more criticism for pricing concerns, they’re directing their resources to other things,” said Casey Mulligan, an economics professor at the University of Chicago. Pharmaceutical companies that develop blockbuster drugs feel as though they’ll be penalized with regulations that restrict prices or allow competitors to develop biosimilars quickly, Mulligan said. Those companies might choose to improve an existing product rather than developing something new and costly, he added. Others argue that regulation is necessary to ensure that patients have access to the medication they need.